I am a Real Estate Professional serving the Suburban Detroit area (specifically the areas listed below). I'm a life-long resident of Michigan, living in Livonia. I'm here to help, that's what I do. 1. To Love and Provide for my Family. 2. To take care of Your Real Estate Needs (including, but not limited to: Telling you things you might not want to hear & Holding Transactions together). 3. Doing everything in my power to keep my daughters (Skyler, Madelyn & Sydney) from growing up. **Quick update. It's not working. The oldest is a teenager now, with the other 2 following fast! Mission Statement: Service is a fundamental element of success in my business. Providing and maintaining the highest level of service to my Clients is a commitment I take great pride in offering. I recognize that buying or selling a home today is a very important, possibly critical, financial decision, and I strive to handle every transaction with complete Honesty and Integrity. 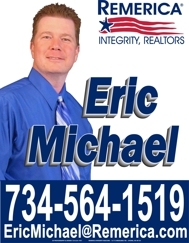 I am not only a Realtor®, but an educator, advisor, problem solver and negotiator. I believe that with each Client that I represent, a Relationship of Trust is formed, one which should be cultivated and treated as a long-term partnership, not just a one time transaction. Understanding and implementing the kind of service that lasts a lifetime is my goal with every Client. Our primary focus and expertise is in the Western parts of Wayne and Oakland Counties (including Northeastern Washtenaw County), Michigan, making special exceptions for Clients in other local areas depending on circumstances. Cities & Townships include: Northville, Novi, Livonia, Plymouth, Farmington, Farmington Hills, South Lyon, Canton, West Bloomfield, Wixom, Walled Lake, Redford, Garden City, Westland & a few others. Today's Market Conditions have our attention concentrated on Short Sales, Foreclosure Prevention and working with Home Buyers. That being said, we continue to attain the goals of our clients in Buying, Selling and Short Selling Luxury Homes & Estates, and have developed an affinity for working with Golf Course Communities. Investors and New Construction purchases are also a priority. Still using some "Old School" techniques, I feel it's more important to draw on today's Technology, including Internet Marketing, Blogging, Social Media, etc, to accomplish our goals. We are always learning, searching and striving for new breakthroughs in Technology to give us (and you!) an advantage in our Real Estate endeavours.